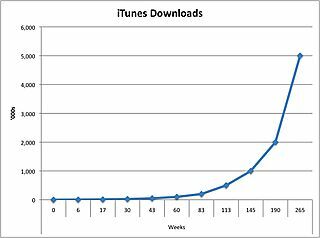 It’s worth highlighting that the number of weeks required for the second 2 billion downloads took less than half the time that it took to reach the first 2 billion…hence the exponential curve, not a straight line…the rate of change growth is accelerating… Ray Kurtzweil would be pleased to see exponential growth in action. I’ve been road-testing Apple’s new Backup since it’s release. Overall, I’ve been very impressed. I’m using it to backup daily to iDisk certain frequently-used files and also to my iPod. The incremental backups means time spent backing up is minimal every day. And I haven’t experienced any of the Backup weirdness that plagued Backup 2.0- it was very unreliable and I almost never successfully completed a backup. However, as easy as it is to backup- no backup software is worth its complied code if it doesn’t RESTORE reliably. Last night while playing around with the WordPress beta, my Safari preferences got nuked. (Yes, there appear to be some very nasty bugs for OS X users with the WordPress.com site). Restoring my Safari preferences was a piece of cake: I had previously selected the "Personal Data & Settings" backup plan, so I opened that plan, selected restore, the date and source and then Safari settings. The only criticism is that the entire backup had to be downloaded from my iDisk before the Safari settings could be restored- i.e. Backup didn’t selectively download those files. If the files are absolutely mission-critical, a short wait is a small price to pay for getting those files back. The only other hole I had pointed out with Backup was the lack of a cloning option allowing bootable copies of your entire hard drive. I’ve come across a great program called SuperDuper! that appears to be even better than the venerable CarbonCopyCloner that CK swears by. It costs $20, but the combination of Backup and SuperDuper! is all the backup software you need to recover from a serious data loss situation. And just because you aren’t backing up doesn’t mean a hard disk failure isn’t out to get you! There are further QuickPicks for Backup 3.0 available here. Like any Mac devotee, I rushed out and bought me a Mighty Mouse as soon as possible. My first impression was good, then I installed Apple’s Mighty Mouse drivers and was met with horror as my System Preferences went haywire. They still switch on me at every restart. [Update] Apparently, this is a widespread problem. Then my mouse started sticking when I would click. I thought it was me, but I’ve returned the mouse and am sitting here with a new one- I definitely had a defective Mighty Mouse the first time. I still can’t program the scroll wheel to do a cmd+W. Hopefully, Apple will add more ability to program the mouse *exactly* like you want it, instead of how they want you to use it. Overall, the mouse performance is fine for my needs- as long as I can add cmd+W- and is light as a feather. It’s just like using the original one-button apple pro mouse, but with the ability to right click. If you’ve got the spare cash, pick one up- just avoid the Apple Mighty Mouse Driver. Mighty Mouse number two has died. The scroll wheel stopped working last night… It’s going back to the Apple store tomorrow and I’m getting my money back. Plus, my hand actually hurts from using this mouse. It is incredibly non-ergonmic. I’ve seen other people mention wrist and hand problems after extensive use of this mouse- I can coo-berate those claims. The Mighty Mouse has to be one of the worst releases from Apple in ages.